The Arkansas State League was a Class D minor baseball league that operated primarily in Arkansas from 1908-1909. The league was formally organized on March 15th, 1908 in a meeting held in Little Rock, AR. Thomas J. Craighead of Hot Springs was elected president of the league in that meeting, and Argenta (now North Little Rock) and Poplar Bluff, MO were granted membership, joining Hot Springs, Pine Bluff, Helena, and Newport. 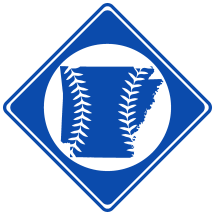 12 The 1908 bylaws officially designated the league as the "Arkansaw State Baseball League," but the official name was amended to "Arkansas" in the 1909 spring meeting. The season opened on April 20th. On June 1st, Poplar Bluff dropped from the league and was transferred to Brinkley, AR. No playoffs were scheduled and Hot Springs was declared the winner. On December 10th, 1908, a annual meeting of the league was held and W.W. Hurst was elected the new president of the league. The 1909 season opened on April 15th and ran until it folded on July 7th. The league soon reorganized as the Northeast Arkansas League. 5. 1910 Reach Baseball Guide.